There are some simple steps you can take to help prevent Lyme disease – from the right clothes to the right bug spray – and they start with awareness. Biologist Chuck Lubelczyk had Lyme disease once. His colleague, Susan Elias, has never contracted the debilitating disease, which is spread to humans through the deer tick. This is amazing, considering that both have worked as field biologists, collecting deer ticks for the Maine Medical Center Research Institute, for 20 and 17 years respectively. They take several precautions to prevent getting ticks – and follow them religiously. That Lubelczyk has had Lyme disease only once is an achievement. 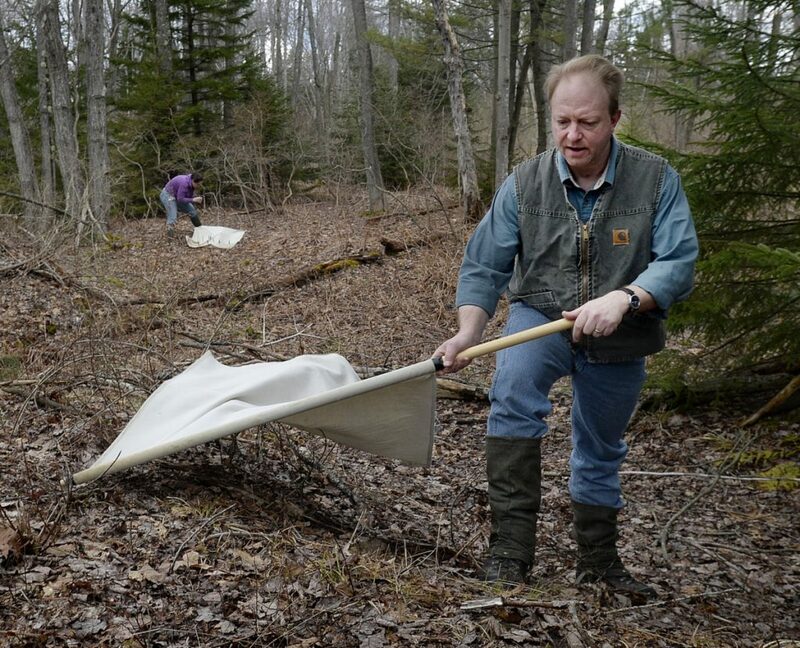 His work involves going into the most tick-ridden places in Maine to collect ticks carrying the Lyme disease bacteria. Most weeks he’s in high-tick regions. Then he goes home to a midcoast farm, also in high-tick country. Every year there are more cases of Lyme disease in Maine. And more tick-borne diseases are moving to Maine. “The Lone Star tick was just found in Connecticut,” said Lubelczyk, about the tick that carries a disease that makes people allergic to red meat. There were 1,787 cases of Lyme disease in 2017 in Maine, an increase of 48 percent from two years before. Last year there were 662 cases of anaplasmosis, more than three times as many as in 2015, when there were 186 reported cases. Symptoms of Lyme disease include joint pain, fatigue and headaches. Symptoms of anaplasmosis include nausea, vomiting, fever and headaches. These tick-borne diseases are becoming more of a concern as a warming climate allows ticks to spread throughout more parts of Maine. When researchers started tracking deer ticks in Maine during the 1980s, ticks were confined to the southern coast and midcoast. Today, Lubelczyk said, their range extends from Mount Desert Island south along the coast to York County, north to Bangor and west from there to Rangeley. It includes everything in between. And the disease-carrying pests are spreading farther north. Elias said climatologists project that by 2050, the deer tick will thrive in all parts of Maine except the highest elevations, such as the top of Mount Katahdin. Lubelczyk and Elias shared their secrets to keeping ticks off them in the field, but they said these tricks really are not secrets anymore. Their methods have been around for years, though people choose not to make these habits. Many people enjoy wearing open-toed shoes and sandals in the summer, and who wants to wear pants? Lubelczyk never dresses for fashion outdoors. When Lubelczyk goes in the field, he wears an old collared dress shirt, pants and muck boots or gaiters – the kind used by skiers. He covers his field clothes with permethrin every four to five times he goes into the field. Permethrin is a synthetic chemical that acts like a natural extract from the chrysanthemum flower. It works by attacking the nervous system in insects, causing paralysis or death. It is toxic to insects, fish and cats, but considered safe to humans and dogs. Permethrin is used by applying it lightly to clothing. It is not meant to be sprayed on skin, like bug spray. It should dry before the treated clothing is worn, and it is effective for up to seven washes. Lubelczyk also does a tick check every day in a full-length mirror, and checks his three cats and dogs by feeling, not just looking. With the rise in tick-borne diseases in Maine many outdoors people are looking for ways to repel ticks. Some swear by all-natural bug sprays, although none have been proven to prevent Lyme disease. George Lee of Manchester used to mow his lawn and find ticks on his pants or legs. When he was on vacation in a mosquito-ridden area of South Carolina, he came across an all-natural bug spray. Lee found that it worked and went to the Internet to concoct his own brew. He now makes a mix of lemon grass and eucalyptus oils and water. Lee said he has not had a tick on him in two years. In recent years, all-natural tick repellent sprays have become something of a cottage industry in Maine. They use essential oils, such as lemon grass, cedar and rosemary oil. A decade ago Allen Pollock in Windham developed Skeeter Skidaddler. He swears by his all-natural tick repellent so much he offers a money-back guarantee. Good Natured Brand, a North Yarmouth company launched by two women in 2015, produces bug repellents and other natural products. And Flick the Tick, which is produced by two sisters in Fayette, hit the market in 2017 and now is sold in more than 400 stores around New England with plans to expand next year to Ohio and Michigan. “We’re now getting orders from Florida and Louisiana,” said co-owner Heather Peel.